Last night the Minnesota Nurses Association authorized an indefinite strike at 14 metro area hospitals. We’ve not been excited about this prospect and feel that both sides have been more focused on control and power than actual negotiations. It seems odd that anyone would relish the idea of a strike, but many floor nurses have been excited. The union says that 84% of members approved the strike action, but hasn’t actually released the number of nurses who voted. In May 3/4 or approximately 8,000 of the 12,000+ nurses voted, with 90% approving the one day strike. The MNA has finally posted a side-by-side comparison of the negotiating points as of June 15. Nothing has changed since then, except the vote to authorize a strike and the fact the MNA rejected the hospital’s condition of no strike until after July 31 to restart negotiations. Below is the comparison of the MNA and Fairview’s negotiating points (assuming the MNA isn’t distorting the hospitals). A list of the hospital’s proposal’s can be found here. 1. Staffing Ratios ? Acuity: MNA negotiating teams have asked hospitals to address “Staffing” issues. The proposal that was made on Staffing and Acuity was supposed to be a starting place not the place where we ended up. 2. Educational Development: MNA proposes that all education is scheduled quarterly in 4 or 8 hour blocks, this does not cost the employer anything. future, there is no cost to this proposal. 6. Technology: MNA proposes that technology does not replace clinical judgment. 8. Bargaining Unit Protection/Kentucky River: Charge nurses have always been a part of our union and this proposal ensures us that the employer cannot challenge their standing within it. 9. Bargaining Unit Protection: MNA proposes the employer will not require a nurse to choose between her or his contract and their clinical specialty. 10. Incorporation of Interim Agreements: MNA proposes all understandings reached between the two parties are consistent with the contract. 12. Wages: The union has modified our proposal but we are confident that wages are not the sticking point. 13.Insurance Benefits: We have proposed 95% employer paid health insurance. Reduced Wage Proposal for each year but we are confident that wages are not the sticking point. In addition to the above, a full-time nurse working a permanent night shift for at least six (6) months shall receive an additional twenty (20) hours of regular pay at the end of each six (6) month period. Part-time nurses working a permanent night shift for at least six (6) months shall receive a bonus payment that is prorated from the above number of hours. This provision also applies to nurses working permanent night alternative weekend schedules. If additional reductions are indicated, low-need days shall be taken by the least senior regularly-scheduled nurse scheduled for the particular unit and shift where the reduction is necessary. The work shift of a nurse will not be involuntarily cancelled after the start of the shift. No regularly scheduled nurse shall be required by the Hospital to take more than six (6) low need days per calendar year (48 hours). Starting first with the least senior nurse on the seniority list who is scheduled to work on the unit and shift where the low need will take place, that nurse will be advised he/she is not needed for that shift or a portion thereof. On the next occasion where a reduction is needed, the Hospital will advise the next least senior nurse scheduled on the unit and shift in question and he/she will be advised he/she is not needed. This practice will continue through the seniority list with the intent that all nurses share as equally as possible in low need days. A nurse to be assigned a low-need day pursuant to this Part D shall be given a minimum of two (2) hours advance notice before the beginning of any shift which is being cancelled. Casual part-time or temporary nurses shall not be assigned to work on units for which the nurse receiving low-need days is oriented or otherwise qualified. Nurses having hours reduced shall be given first opportunity for subsequent additional work hours that may become available to replace work hours lost. A nurse who has an authorized hours appointment of 64-79 hours and either twenty-five (25) calendar years of service or 35,000 hours of seniority will not be required to work holidays provided it does not have the effect of depriving patients of needed nursing services. Delete the last paragraph in Section 22 C.
Modify these Sections as indicated below so that effective January 1, 2011 benefit eligibility is determined by being authorized to work forty (40) hours or more per two week payroll period. Effective January 1, 2011, nurses authorized forty (40) hours or more per two (2) week payroll period shall be eligible for the same hospitalization insurance benefits as full-time nurses. Effective January 1, 2011, the Hospital shall provide and pay the full cost of a group term life insurance program for full-time nurses and regular part-time nurses authorized forty (40) hours or more per two (2) week payroll period. Effective January 1, 2011, the Hospital shall provide and pay the full cost of a group term dental insurance program for full-time nurses and regular part-time nurses authorized forty (40) hours or more per two (2) week payroll period. Effective January 1, 2011, nurses authorized to work forty (40) hours per two (2) week payroll period or more shall be eligible to participate in the same health insurance plan as the non-contract employees as the plan may exist and may be amended from time to time. Delete the last sentence in Section 29 A 2 and delete Sections 29 A 4 and 29 A 5 d in their entirety.. The Hospital shall provide and pay the full cost of a long–term disability insurance program for full-time nurses and part-time nurses authorized forty eight (48) hours or more per two (2) week payroll period. Update the list of certifications as needed. Fairview Southdale Hospital and University of Minnesota Medical Center – Riverside Campus adopts the pension proposal as proposed by the Hospitals in a letter to Mr. James Bialke dated May 3, 2010 – see attached. First year – No across-the-board increase. Step increases to continue. Second year – Effective with the pay period commencing closest to June 1, 2011, there shall be a one percent (1%) across-the-board increase to the basic minimum salaries indicated in the Staff Nurse Salary Charts. Step increases to continue. Third year – Effective with the pay period commencing closest to June 1, 2012, there shall be a two percent (2%) across-the-board increase to the basic minimum salaries indicated in the Staff Nurse Salary Charts. Step increases to continue. Except as set forth above, the new contract shall be effective from June 1, 2010 or the date this contract proposal is ratified by the Union, whichever is later, and shall run through May 31, 2013. I couldn’t find a copy of the current (now expired) contract. But trust me, it is quite generous! Well election euphoria is still rampant here in Minneapolis. People were dancing in the streets, setting off fireworks, and more Tuesday night. I’m not going to discuss politics today but more post my thoughts of working in a school that hosted a polling site. A lot more went into this than I expected. A few of us (including the principal) had a meeting to talk about logistics of the day. We had to make sure our students were safe, didn’t interfere with the voting, and our school looks good. The way our building is setup we don’t have a secure way to section off part of the school, which turned out to be fine. A funny part of the logistics is that the school district won’t allow the “general public” to use our restroom facilities. So someone ponied up the money to rent port-a-potties. Yes, we had 4 port-a-potties sitting outside our building. – Fortunately, for the last two the people just laughed. – Some voters waiting in line very early threatened to call the cops on a student holding an Obama sign if we didn’t make him put it away – we did. The only cop that I saw around all day was our Liaison. – Throughout the day students would walk by the voting room and say something like Obama or McCain. Interestingly, no kids said anything about our levy or referendum on the ballot! – Every polling site had a Kids Voting Booth. It kept track of which school the students attended – not necessarily the polling site. Our school had 67 students vote – 65 voted for Obama,29 voted to pass the school levy. – Voters lined the hall, out the door, and around the corner… the wait wasn’t ever more than 30-40 minutes. – Voters enjoyed the chance to talk and catch up with their neighbors and friends. It was good to see the kids react to the election and to see democracy in action. We have a large percentage of students who are first or second generation immigrants. Some of these student’s parents aren’t able to vote but they got to see the power of democracy. A co-worker said she ran into a bunch of Somali’s cheering in the streets – and they couldn’t vote but were so excited to watch democracy in action. A final note, the Family Liaison, was in charge of working with the election judges and making sure everything went smoothly. Talking to the election judge mid-way through the day, the judge commented to her that they had gotten a lot of comments about welcoming the school had been and especially the principal. My co-worker was shocked because our principal wasn’t even there. Everyone thought the Liaison was the principal!! A funny story from election day. I think I’m moderate about a variety of issues, but also moderate in that on some issues I’m conservative while others I may be a bit more liberal. In theory I like the idea of a small government and local control and as a Christian ideally having the church do much of the work that the government is doing. But I don’t think that the idea of a free market works anywhere close to 100%. I’m sure you’d agree to some extent that the true laissez faire approach won’t work. I think that our Biblical worldview shows us that humans are naturally self-centered and want what is best for ourselves. It is only after we have been redeemed that we can understand unconditional love and sacrifice for others in the purest sense. Therefore I think that if there were no regulations on the marketplace/country in general then all hell would break loose. I think a pretty easy example of this would be health care. Letting the health insurance companies dictate the rules and regulations has left a lot people un- or under-insured. And like back in the old days when they would just deny all claims as SOP. Insurance companies want to increase their bottom line and will do whatever it takes to make sure their CEO gets a nice little bonus. I won’t dive into specific policy details, but simply put everyone should have access to some type of affordable health-care. We are currently paying insurance premiums that go up in part because our neighbors can’t afford a doctors visit and go to the local ER instead. This is expensive, partly because ER visits are generally more expensive, but also because many times the illness or injury has taken a severe turn for the worse. A close relative went to several urgent care facilities with stomach pains because she didn’t have health insurance. This is a little bit cheaper and more responsible than an ER, but because she was seeing different doctors no one really thought there was a real problem. I think ultimately she caught a good doctor and he realized something bigger was wrong and they found her cancers. But if she hadn’t got a good doc? who knows.. At the time she was being treated at Wishard hospital (which is a pretty decent place) but now that she has insurance she can go to IU Med Center (one of the top research facilities in the country). Why the disparity and double standard? Getting the cold or flu treated early can be a lot cheaper than treating pneumonia or something worse. Another major health related issue is prevention. Diabetes is a huge drain on the health-care system and can be prevented or at least have the affects stunted by proper preventative health-care. I could go on but the last point I’ll make about health care (I think) is that much $ is spent on CYA testing and procedures because everyone is afraid of getting sued. To an extent this is healthy but what is wrong with some type of tort-reform to prevent frivolous law suits?? I’m a moderate because I think abortion is a heinous act, but should a small government interfere? Or why not actually do something to prevent abortions from occurring?? We’ve had a pro-life government for at least 4-6 years and what changed? Yes, Chief Justice Roberts is a stalwart pro-life choice, but he also doesn’t believe in legislating from the bench so he isn’t going to overturn Roe v Wade anytime soon. I’m moderate because I think peace is a great idea, but sometimes we need to project and act out our power and military might just to remind people that peace takes some work. And maybe we should occasionally live up to our promises and really be a leader (Darfur). I’m a moderate because I think each individual person has inherent worth and dignity as a child of God and each person should have the equal opportunity to succeed in life. Just because I grew up in a screwed up family doesn’t mean I should be forced to live a screwed up life. I was blessed to have people around me who cared and supported me – not everyone has that. A family living in the ghetto struggling to make ends meet needs more than a free lunch at school to ensure educational success. Why can’t inner-city schools have the same gorgeous/opulent facilities of a suburban school? Why must the school I work at scrape together every possible resource to make sure our students can pass a test? One of our students saw his mom stab her boyfriend in the eye with a screwdriver and another student saw a man gunned down on the street and those are just two instances that I know of. We have an amazing staff but kids still get lost because of their home and surrounding environment. Why should they pay for their parent’s sin? I’m a moderate because I believe the US is a nation of immigrants, founded and prospered through illegal immigration. Yes we need to do something to insure the physical safety of our country, but immigration is a part of our history and the global economy in which we are a part. If we want to insure national security we need to do more than kick out immigrants and build fences, we need to make sure that our trade policies are a little fairer, we need to make sure that people around the world have a chance at education and maybe a real meal or two a day. Did you know there is enough money in the US alone to (on paper at least) end world hunger? Why should we spend millions of dollars to ship food to Africa on an American flagged vessel, when African farmers produce the same product? If we spent our food aid money on food in Africa, we could help African farmers and their entire country pull themselves out of poverty – which makes our country a little safer. I’m a moderate because I don’t think drilling off-shore is going to produce any long-term benefits to our energy issues. Drilling off-shore will only allow us to keep the status quo a little bit longer. How can all the major auto manufacturers make cars that meet California emission standards or cars that are much more fuel efficient but get shipped overseas – yet claim they can’t produce the same car for the US? Did you know for awhile that Honda produced the most fuel efficient vehicle on the market – but it was gas powered? At the time according to Consumer Reports the Honda gas-engine car was overall more fuel efficient than the hybrids being produced? The market dictated more horsepower and said hell to fuel economy, until energy costs sky-rocketed. When I worked at Honda’s Accord and Acura plant they switched all kinds of parts around for a European or Asian and even Californian bound car to make them meet the stricter standards. Why shouldn’t the government step in and make some minor requests for the long-term benefit of our country. I guess those are few reasons why I am a moderate… no one party has all the right answers for me. With that said, each of us will make the best decision we think possible on November 4. As American’s we should go to the voting booth and vote within the best of our knowledge and conscience. We don’t vote on only one issue, but see biblical foundations for our concerns over many issues. On Nov. 4, Christians will not be able to vote for the kingdom of God. It is not on the ballot. Yet there are very important choices to make that will significantly impact the common good and the health of this nation — and of the world. So we urge our Christian brothers and sisters to exercise their crucial right to vote and to apply their Christian conscience to those decisions. And in the finite and imperfect political decisions of this and any election, we promise to respect the Christian political conscience of our brothers and sisters in Christ. I think we can all live within these 5 “rules” of discussion and life. What do you think of these? In case you missed it the Republican National Convention was in my new town this week. Before you click away, this isn’t really about the RNC. Only partly. We did our part and let a sister-in-law of a friend spend the night with us – always glad to be gracious hosts! My penchant for politics made me want to be involved someone, but Christy said if I volunteered, she would go protest. Well I’m glad I didn’t because she might have been a little anarchist (not really but did you see the news?). Ok, now for the main point of this post: World Vision and the ONE Campaign wanted to do something productive with the thousands of people hanging out and taking part in democracy. Sp they took the opportunity to get delegates, friends of the Party, and regular people like us to spend a few hours one afternoon so that we could impact thousands of lives – thousands of miles away. We joined a few hundred other people on Tuesday at the Minneapolis Convention Center to put together Caregiver Kits. We were standing next to a lot of delegates, somebody important from the State Department’s Eurasia division, and I’m sure other “important” people I didn’t know, like the crippled woman or students from Bethany House of Prayer. 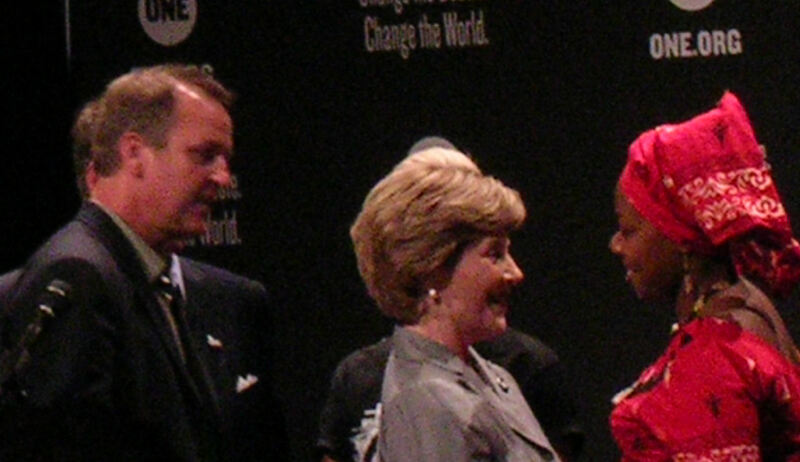 We heard from Senator Bill Frist, Laura Bush, Cindy McCain, and Princess Zulu of Zambia. I will say that of all the “celebrities” in attendance Janet Huckabee actually stayed until the end and did a lot of work putting together the kits. untry can use to “bring dignity and comfort to those living with AIDS.” Please read more about the kits and what they can do. It was a lot of fun to be involved in something that would make a tangible difference in someone’s life. Christy and I probably made at least 40 kits out of the 2,500 total from the event. Simple items such as latex gloves, antibacterial soap, antifungal cream, washcloths, and more can help a person live a better life. A very simple project that has a lasting and powerful impact. The last item placed in each kit was a handwritten note to the caregiver – offering encouragement and thanks for their hard work. 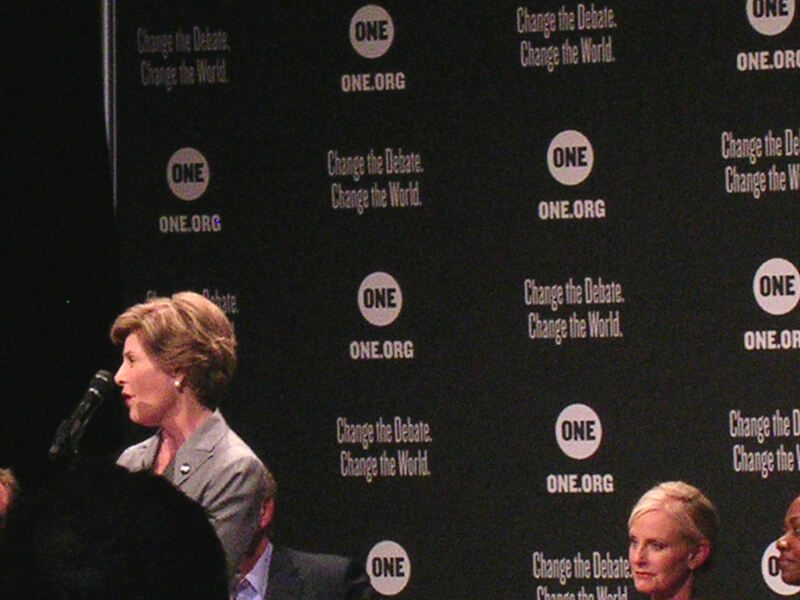 The ONE Campaign has a great write-up and video’s from the event. They did this same event in Denver at the Democratic National Convention, write-up here. 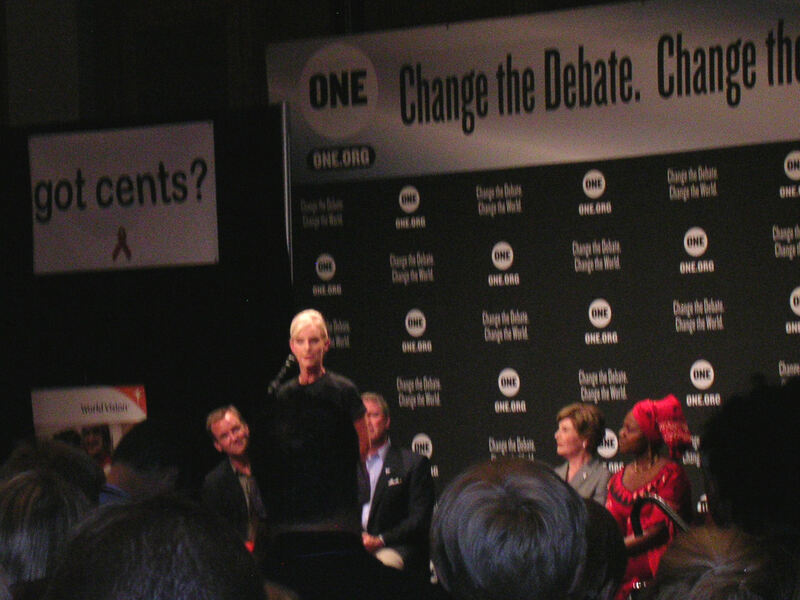 Updated: ONE now has a full video of the speaking part of the event and the “celebrities” creating caregiver kits. What a sick state of affairs. Two stories in today’s national papers strike at stark comparisons in our world today. With Hillary raising $26 million and the total estimates for all 2008 canidates is that they have raised well over $100 million dollars in 2007 and plan on continuing to raise more and more money as the election approaches in well over a year. But unlike the suffering of its neighbors, the crisis in the Central African Republic has largely escaped the world’s notice. International donors pay about $1 billion to support the effort to feed and shelter two million displaced people in Darfur. Here that figure is about $50 million, United Nations officials say. That has meant little assistance for people left utterly destitute. Jean-Charles Dei, the top official of the World Food Program in the Central African Republic, said on a visit to Otah on Friday that his organization had no food available to feed the 1,700 people hiding here. Its operations here are chronically short of cash. In all, 2.5 million people have been forced from their homes in the three countries. In Darfur at least 200,000 people have died, and perhaps the toll is more that twice that number, though it is impossible to be sure without detailed mortality surveys. No one is sure how many have died in Chad, where the violence is linked to Darfur, or in the Central African Republic, which is a close ally of Chad’s embattled government and where diplomats and experts say rebels backed by Sudan have operated. It is more than a little sad that people are willing to make the maximum allowable contribution to an election campaign $2,300 but aren’t willing to send money to help keep people alive or to stop genocide and needless killing fields. I guess its ok since its “just Africa” and they don’t have a strategic use anymore. Well that’s bularky! $2,300 is more than many Africans can make in a year and would double the income for 6 people (of the over 1 billion) who are living on a dollar a day! Every year more than 10 million children die of hunger and preventable diseases – that’s over 30,000 per day and one every 3 seconds. 600 million children live in absolute poverty. (SCF, Beat Poverty 2003). Every year nearly 11million children die before their fifth birthday. Adventures and Thoughts of Team Cross is powered by	WordPress 4.3.19 and delivered to you in 0.562 seconds using 36 queries.